When people look for Berlin, they usually mean Germany's capital city. However, Apple Maps sends you to Antarctica instead. Admittedly, there’s a mountain called Berlin in Antarctica, but only Apple knows why that's the default in its mapping software. Apple Maps can take a while to load textures. Meanwhile, a generic picture is displayed for parts of the map that haven’t loaded yet. This can make three-quarters of the Earth look like a black and white chessboard. This picture is a good example of the many problems Apple Maps has with displaying terrain in 3D. We're supposed to be looking at a bridge across a river. Apple Maps turns the bridge into a mountain. The technology Apple acquired from C3 Technologies seems to have an especially difficult time with structures spanning obstacles. Displaying landscape elements in 3D also seems to challenge Apple Maps. This is a view of the most famous Apple Store in the world, which is situated on an intersection in New York City. The store is correctly rendered as big glass cube. But it's probably safe to assume that the trees around the intersection aren't supposed to look like green Lego pieces. Sometimes it seems like the correct 3D representation of certain areas is more a matter of chance than anything else, particularly when you see a map that simply looks absurd for no discernible reason. This example shows the Islington Subway Station in Toronto. We’ll probably never know why it's a huge hill, instead. Apple thoughtfully marks points of interest like shopping centers, schools, restaurants, and gas stations with small symbols. In the middle of Houston, Texas, the company's servers seem to have mistaken rooftops for gas stations, which are handily located 40 stories off the ground for your flying car. Or maybe Apple just knows that everything's bigger in Texas? We’ve already seen that Apple Maps has trouble with streets going over bridges, and the Golden Gate Bridge in San Francisco, California, is another example of this. The road goes over the bridge as it should, but it does so by going all the way up to the top of the bridge’s suspension towers. At least the view should be spectacular from up there. The road then continues across the bridge after a small gap. Sometimes Apple Maps just can't focus in when loading maps at all. This is the small town of Coniston in northern England. The street names are placed correctly, but otherwise all we get is a huge mess of pixels. So what’s going on in Coniston? We might never know. The Brooklyn Bridge in New York City didn’t escape the bugs with Apple's Flyover feature, either. It’s not that it isn’t displayed correctly; rather, it vanished altogether. All we get is a black line going through the river, cutting out a part of the map completely. You can work around this by reverting back to flat satellite images, of course, but we think this is more entertaining. Google Maps sometimes has problems finding the most efficient route to your destination. But even if it takes you the long way, at least it gets you there. Apple Maps has you driving around the neighborhood in circles, and it doesn’t manage to get you all the way to where you want to go, which was only about a mile away in this case. Sometimes, you might spontaneously feel the need to buy an Apple product. Apple Maps has you covered by displaying every last Apple Store there is. Then again, it looks like displaying them in the right places is beyond this application's scope. Here, Apple Maps confuses the address and ends up on a different street. The Burj Khalifa, or Burj Dubai, is the tallest building in the world, and has been since 2008. Apple Maps' 3D display function should be a great way to see just how imposing of a structure it is. But the Burj Khalifa is flat in Apple Maps. Instead, we get our sense of the building's 828 m height from its shadow on the ground. Apple Maps' 3D display looks really nice, when it actually works. In this example from London, England, the difference between "working as intended" and "whoops" is as clear as two sides of the road. On one side, the buildings are flat, and on the other, they're rendered properly in 3D. If you’re trying to find the closest restaurant, then maybe Apple Maps is not the way to go. In this example, the restaurant is in the middle of a construction site. 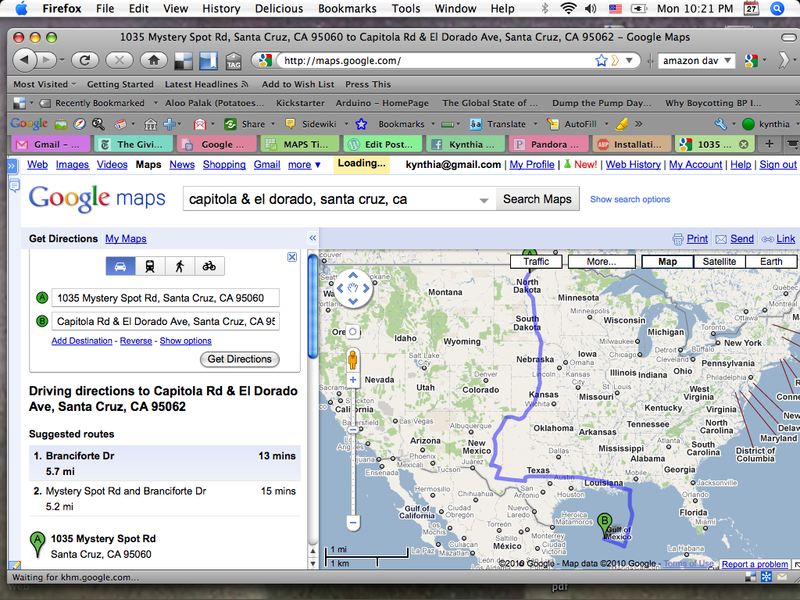 Similar to Google Maps, Apple Maps lets you enter the name of a country, a city, or an address. Then, it shows you that location on a map. If you’re looking for Rome, Italy in Apple Maps, you’re presented with a much more adventurous suggestion: Pyongyang, North Korea’s capital city. If you want to travel from San Francisco, California, to Sausalito, California, separated only by the San Francisco Bay, you’d expect to do so via the Golden Gate Bridge. Sausalito is just on the other side of it, after all. Apple knows the value of a good look at Alcatraz, though, and has you take a ferry across the bay instead. If you thought that we ran out of examples where Apple struggled with bridges in 3D, you were wrong. We present to you the Severn Bridge (or Apple Maps' version of it, anyway), connecting Monmouthshire in South East Wales and South Gloucestershire in South West England. We’re puzzled by the waves in the landmark, particularly when the bridge's shadow is displayed correctly. It looks like the city of Sundsvall, Sweden, has so much bad weather that Apple just couldn’t get a clear view of it from a satellite. No problem for Apple! The roads are just placed on top of the clouds. What lies underneath is up to your imagination. Are you a film noire fan? Then Apple Maps' view of the Malaysian state of Terengganu is for you. Not only is the state displayed with so little detail that it’s hard to make out, but it’s also in black and white. It looks like the image might have been taken 60 years ago. Apple Maps could use some updated pictures. We already know that bridges aren't Apple Maps' strong suit, so what better way to beat a dead horse than show what happens when you try to have a look at multiple overpasses in the same shot? It looks like an earthquake had its way with this busy intersection of interchanges. It's hard to even make out the streets through the waves and edges. After seeing the photos - "It's the End of the World as we Know It"
Jobs never would have let this thing out of the door. Shame on Apple. I'm wondering if they do any testing (alpha, beta, etc) or Q.C. of their apps at all? By fails, I was expecting more of a "turn right" into a river or a high-ground bridge, but most of these are immature satellite pictures and inaccurate location settings that were existent in the early Google Maps. Apparently maps apps are more complex and harder to make right especially with 3D pics added. And apple just jump in thinking they could just fix any whoops on the fly and just ride out the storm. The apple article many will like! What Apple should do it keep this version and restamp it "Electronic Acid Trip Maps" for a novelty. Oh, and add the purple flare to the pictures! They should have just drawn scribbles. Another notable one: The Statue of Liberty is completely gone. Sometimes, you might spontaneously feel the need to buy an Apple product. Nooo! You are looking at it the wrong way! Picture 8 isn't Coniston, it's actually the street map of Lancaster. so thats why my road trip from NY to Rome landed me in a cold prison colony with pictures of the "dear leader" everywhere. one other thing, in picture 20, I would prefer the city to look like that, Imagine getting good off road vehicle and driving around that area at full speed. That will make your trip to the store a lot more exciting. reprotectedBy fails, I was expecting more of a "turn right" into a river or a high-ground bridge, but most of these are immature satellite pictures and inaccurate location settings that were existent in the early Google Maps. yes, google maps had some pretty fun flubs when it was introduced 7 YEARS AGO!!! Most people that purchase apple products do not mind their relatively high prices because the product generally works very well out of the box, they are simple to use, and their bundled software tends to be very good. For apple to stop using Google Maps early (still 1 year on their contract), while forcing a new and immature product on it's users is simply not the apple way. Designing a product and leaving out features so that people have to upgrade in a year or two is the apple way, but it is one thing to leave out a feature, and an entirely different thing to give a feature that has so many issues. I am sure that apple maps will improve a ton very quickly, but it is not like them to release something half-assed. As stated by boece: Jobs would have never let this happen. Ever. And if something like this did happen, entire departments of people would be fired and replaced. Thus begins the sinking of apple from being the product of superiority, to just becoming another company with flawed products. At least Google released Maps/Earth as a beta and worked to correct many issues before removing the BETA tag. Looks normal to those living in a reality distortion field. Apple map's dolphin user_friendly. It includes swimming route also. Believe it or not, some people don't own iPhones and haven't had to deal with the maps nightmare. I guess my Android phone...just works? burmese_dudehttp://media.bestofmicro.com/ios-m [...] 558-22.pngApple map's dolphin user_friendly. It includes swimming route also. Google when they switched over from f/k/a Tele Atlas (now TomTom) suffered the same exact problems, and both Apple and Google have the resources to have stellar data though I prefer some of Apples third-party choices e.g. Yelp vs Google Places.